Finally, both Albion’s and Rondón’s scoreless runs came to an end. The teams first goal in almost nine hours of football was scored by the Venezuelan, notching his first Baggies goal of 2017. 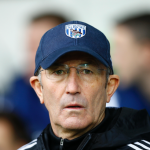 Albion’s dreadful run since the end of February has led to many commentators highlighting the record of Tony Pulis’s sides after reaching the magical forty point barrier that, psychologically at least, represents the target for Premier League survival. I decided to take a look at the statistics, and it doesn’t make good reading. Arguably, Albion could have easily won any of their last three home games, but all three were lost 1-0 and Tony Pulis’s team have set an unwelcome club record of five games without scoring.